Before we delve into the step-by-step guide to using free sessions to enroll clients, here are the 3 main reasons why they are so effective. You are able to show your expertise and give prospects a taster of what to expect down the line. A free session allows you to build that all important emotional connection and relationship which make clients ‘stick’ to you. A free coaching session is a highly effective way to assess if they’re your ideal client and if they are, move them further along the client pipeline. The basis behind the free-to-paid model is to efficiently engage clients and make that transition onto a paid programme. This step is crucial. Unfortunately, many coaches get it wrong.I am going to let you in on a little secret: highly successful coaches aren’t necessarily the most skilled or experienced. A huge element is their mastery of the transitioning from the free-to-paid model. Way back, I was at a crucial juncture of my coaching business. I was making the transition to coaching on a full-time business. Consequently, it was so critical that I increase my client base. In desperation, I bought a very expensive program by a ‘guru’. The strategies were sound’ however, they simply weren’t translating into results. Moreover, they were long-winded and required additional monetary investment. It was taking so long that I became burnt out, and had dark circles around my eyes. I have been using them since 2011 when I quit my job as a Management & Leadership Development Specialist, and this method alone has been responsible for high five figures being added to my business. Let’s jump into what has worked for me, so that you can reap similar rewards for your business. Coaching Sessions vs Coaching Programmes: What Is The Difference? In brief, a coaching session is a one-off booking. On the other hand, a coaching programme is a series of sessions designed to achieve a goal over a period of time. Personally, my coaching programs are a minimum of 90 days. This is so that clients get the full benefit of my knowledge and experience in order to take big transformative steps and see real changes happen. 1) Coaching programmes allow for true transformations to occur. As a result, clients are more likely to get big results. On the other hand, sessions are short, and it is easy for a client to feel temporarily inspired and motivated. Consequently, coaching programmes make it more likely that your clients get life-changing results. As a result, referrals flow into your business. Plus, coaches known for getting results will never struggle to get and keep clients. 2) A coaching programme has accountability and support built-in. These are two key factors for encouraging clients to implement suggested strategies. 3) Money! A coaching programme allows for more revenue per client, plus it allows for more predictable income. This is key when trying to leave the 9-to-5 and fulfil your passion. Clients get big transformative change, and you are able to make a good living, which allows you to help more people. Despite the proven quantifiable benefits of offering well-run free coaching sessions, there remains some misconceptions. Myth #1: Free sessions devalue your expertise and skills. Some people argue that you shouldn’t give your value away for free/or pricing yourself too low. This is true. You need to appreciate your value to increase credibility. However, free sessions are a marketing which help you to achieve your goals. The free-to-paid model acknowledges your value, rather than diminishes it. Free sessions give your potential clients an opportunity to experience the value they would get if they had you in their corner. There’s a reason why Rolls Royce offers free trials to potential buyers. As a professional coach, you need to leave your ego aside and focus on what you’re doing – building a sustainable business. Myth #2: Clients get your “good stuff” for free and run off with it by themselves. Does this happen? Yes, it does…..but if you have run your session properly, helped them get more clarity and confidence, the recipient is likely to feel confident about your expertise, and importantly what you can do for them. From experience, once someone has found an expert they like, they stick with them. The truth is that the majority of your clients will want you to support them in achieving their goals. This has been my experience with running free coaching sessions. Myth #3: You will attract the wrong people. If a client believes that you can help them get what they want, they will go for it whether it is a thousand pounds or ten thousand pounds. The key is in the ‘best fit’ between what you have to offer and the needs of your clients…this is the space where your value exists. So, how do you sift through the chaff and spend time with clients who are befitting of your free sessions? You qualify them. Yes, you are offering a free session but the fact that it is free does not mean it is for everybody. A common mistake most coaches make is blasting their free sessions all over the internet and Facebook groups, in the hope that they will reel in at least one paying customer. When you’re pasting your free sessions all over the internet, you are communicating that you are desperate…and the truth is that the people who you want as clients are not going to go for that. Even if it is a free session, you still have to make your offer attractive. No one wants a free coaching session. They want to solve their problems. Real problems. In any case, our most valuable resource is our time….so there is nothing that is really free. Why would they want to sit with you for an hour? So, don’t blast your consultations, strategy sessions and free calls all over the internet. When you do that, you only attract the wrong people. Option 1: Create a long and detailed questionnaire. You want to make sure that this isn’t multiple choice – make them fill out answers. If they choose to react with “Whoah! I need to put in this much information. Crazy stuff!” and opt out, they have eliminated themselves, freeing you to talk to people who really want your help. A good questionnaire eliminates the people you shouldn’t be talking to. For the people that you do talk to, you’ve got some very detailed information that will enable you to have a productive session with them. If a person sits through a whole training session it indicates that they are serious about improving themselves…. but if a person leaves the training to do other things, or log off after 15 minutes, it says something else about them: that they like the idea but they’re not serious and hungry enough for the transformation they claim to desire.To combat this, create a compelling call-to-action at the end of the training session. To combat this, create a compelling call-to-action at the end of the training session which could be at the end of a webinar or a live, on-location workshop. For instance, you could offer a free session if they’ve bought a product from you: it could be anything from a $7 to $100 product. As soon as they get to your “Thank you page”, invite them to a free session with you. When you offer a free session to someone who has bought a product from you, they have already qualified themselves and that is the sort of person you want to spend your time with. Goals: “Where do you want to be a year from now?” , “What does success look like?”, “What do you want?”. This is where you get to know what their aspirations and dreams are. Then you transition to their current reality. Options: Here, I do things a little differently––I go beyond just brainstorming with clients. When you’re working with a person who wants to grow their business but doesn’t know how, this is where you give a little bit of direction. You have identified a gap between their goals and reality. So, during the free session, help them draw a road map showing them how to get from where they are to where they want to be. This is where they start to get excited and see the possibilities! Plus, the transition to becoming a client is easier because if you help them draft the road map, they would usually want you to help them travel the journey. When done properly it’s so seamless. The client has gained so much from the session, they now have a game plan and they are usually excited about the possibilities of having you with them on the journey. When do you transition from free to paid sessions? When I started getting booked 5 weeks in advance, with clients who wanted free sessions, I knew it was time to put a system in place to do what I love with the same goal in mind: to upgrade them. I had too many people requesting free sessions that I had to move to the discounted sessions model to manage the numbers. I recommend you consider doing the same. Discounted sessions enable you to work further and allow you to work with the number of people you want to work with. Note this: you don’t just decide that you’re too big to do free sessions. I know I didn’t transition that way. Don’t let your ego get in the way of your bank account. Coaching programmes don’t last forever. And you need a good system in place to keep the leads flowing in. Hypothetically, let’s say you have four clients, and one has just finished their coaching programme. This means that your coaching income will decrease by 25%. However, if you had a client already lined up, your income would be maintained. Consistency= stability. And when you have the systems in place to grow your business, you are able to deliver great work, which has the effect of increasing referrals. As a result, your coaching business grows exponentially. Bonus Tip 2: How to run effective sessions with game-changing conversion rates. What is going to sell you to your clients is their perception of how your service can get them the results they crave. The more value you offer your community, the higher the likelihood that they will become your clients. You want them to be sold on you even before they have the free session with you. How do I add value to my community? I run free, weekly webinars for my community and add so much value, just as if my clients paid $100 to attend. Here’s the key: I don’t treat my webinars like they are free. My commitment is that I give so much value that even if its free, the members continue to rave about it afterwards. I don’t hold anything back – I share what works for me. If you hide all your good stuff behind the buy button, very few people are going to experience the good stuff and they won’t trust you enough to buy from you. 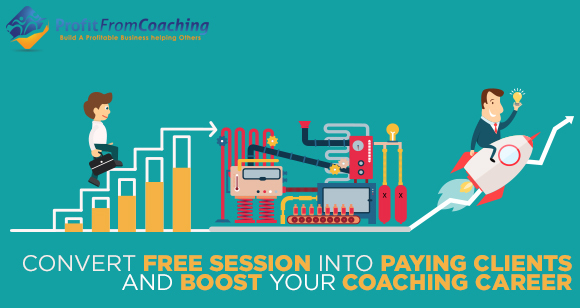 If enrolling clients for free coaching sessions is a piece of cake but you’re struggling to convert them, I will teach you exactly what you need to do to multiply your income, by having people upgrade with ease from your free sessions to your paid programs. Get my free high ticket client enrollment booster video and you will see a significant increase in the enrollments to your coaching programs almost immediately. In this free video, I share a booster that has generated thousands of dollars for me in the past few months. This particular strategy has helped coaches improve their results by as much as 800%. Don’t waste any time, grab your free coaching client enrollment booster here now. Now, I want to hear from you. What struggles are you facing in your coaching business? How can I help you to grow a sustainable business? Previous Post The Secret Ingredient That Turns Your Passion Into A Profitable Business Next Post What Is A Profit Pulling Pipeline and Why Is It Important To You? Great perspective. I follow the model of giving 4 times a much free value per paid coaching program. My goal is to always be adding value. I like that you debunked the myths about free coaching sessions. Nice one DJ! I totally agree with your point of eliminating the tyre kickers early as possible. I started with discounted coaching sessions last month and I don’t think it will be fair on those who have signed up if I switch to free sessions now. What do you advice I do in my case?